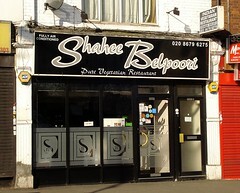 Shahee Bhelpoori was an Indian restaurant in Norbury. It closed for good in December 2013. Indian restaurant in Norbury, very near Norbury Station. They specialise in South Indian food, particularly Keralan. The menu is entirely vegetarian, and many of the dishes are also vegan. They are licensed. According to their website, the restaurant has been there since 1988. Plates are inscribed with the restaurant's name, and tables are clad in proper linen (though napkins are paper ones). Indian art hangs on the walls. Kake, Shuri, Robbie, and djw visited on a Wednesday evening in January 2012. We hadn't booked, but this wasn't a problem as there were plenty of free tables throughout our visit. Music was playing, but not overly loud. Pani puri (£2.50 for six) photo were good and crispy, and there were no leaks after pouring in the tangy tamarind water and chickpea filling. However, the shells were a little over-large, making them a little hard to fit into one's mouth for the single bite necessary to eat them without spilling. Paneer pakora (£3.25) photo were good too; not overly greasy, and with nicely melty cheese. The yellow dipping sauce on the side was undistinguished, with sweetness overpowering any other flavour that may have been there. Samosas (£2.50 for three) photo were OK but nothing special. Thali of the day (£7.50) photo was fine, consisting of four individually-spiced curries (cauliflower, carrots, chickpeas, dhal) along with rice and a fresh-tasting paratha. We also sampled the uthappam (£6.75) photo and the Shahee masala dosa (£6.50) photo. Service was a little odd, with one of the waiters insisting that they had vegan paneer available, made in-house with soya milk; his colleague later let us know that this was not actually the case, and the first waiter "had misunderstood". In addition to this, there were several not-actually-vegan dishes marked as being vegan on the menu. Vegans would do well to double-check their orders. Accessibility: A step to get in. It's step-free once you're in, including to the toilets. Last visited by Kake, Shuri, Robbie, and djw, January 2012. Last edited 2016-05-15 17:44:49 (version 11; diff). List all versions. Page last edited 2016-05-15 17:44:49 (version 11).